While defined benefit pension schemes are typically viewed as users rather than sources of sponsor-firm funds, the considerations taken into account when firms choose to scale contributions are such that they become indistinguishable from other firm financing decisions. This column analyses how pension scheme funding deficits arise and argues that whilst deficits do not exist by design, firms’ decision to fund or underfund a defined benefit scheme might usefully be examined as one of many competing sources of long-term finance. How do pensions deficits affect company behaviour? 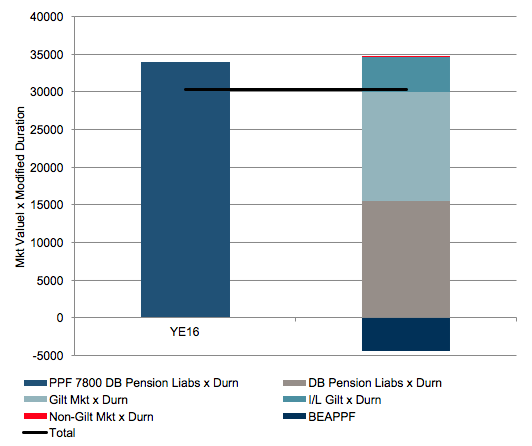 The changes in the present value of the UK’s defined benefit (DB) pension schemes’ PPF 7800 liabilities (a measure of beneficiary-capped liabilities) are driven primarily by changes in long-term bond yields (Pension Protection Fund 2016). By contrast, their assets have been less sensitive to these yield movements (top panel in Figure 1). And DB pension schemes in the UK are large. Indeed, private sector DB schemes collectively have liabilities greater than the stock of GBP-denominated fixed income instruments, meaning that it has not been, and is not, possible for DB schemes to cashflow match or duration match liabilities with corresponding assets (bottom panel in Figure 1). Note: Estimated market value multiplied by modified duration of UK fixed income market held outside of Bank of England Asset Purchase Fund Facility compared to present value of PPF 7800 liabilities multiplied by PPF estimate of liability present value sensitivity to shifts in yield. One of the motivations behind the Bank of England's quantitative easing programme has been to lower long-term bond yields (Joyce et al. 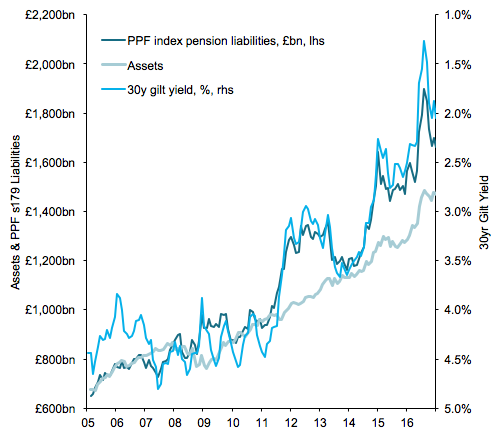 2011), much to the chagrin of underfunded defined benefit pension scheme sponsors (NAPF 2012, PLSA 2016) for whom lower long-dated UK yields have delivered higher pension deficits in aggregate. While lower long-dated yields might hurt defined benefit schemes' funding positions, it stands to reason that their sponsors should be able to benefit from access to lower cost long-term financing rates. But the structure of the UK lending market is problematic in this regard. First, term finance with a modified duration of around 20 years is not typically available through bank channels. Second, the proportion of firms large enough to issue bonds is small, and longer-term bond finance is available only to a higher credit quality subset of large companies.1 The result has been that while firms have incurred costs with respect to higher pension liabilities, they have not been able to benefit from lower long-term financing rates. However, we observe that the ability of DB sponsors to underfund their pension schemes has provided them with a means by which lower long-term yields have translated into lower long-term financing costs. It is important to note that this is an observation and not a recommendation! A defined benefit pension liability can be analogised as long-term borrowing, financed at an interest rate equal to the sum of three components. First is a component informed meaningfully from long-term government bond yields.2 The pension fund discount rate is chosen through a process of negotiation with the sponsor’s appointed actuary (where a higher discount rate will reduce the present value of the liability and so reduce any pension deficit, but increase the hurdle rate for pension fund asset returns over subsequent years). Second, there is a component analogous to the credit spread. The Pension Protection Fund applies a levy, the size of which is a function of the sponsoring firm’s Experian credit score, the size of the pension scheme’s s179 liabilities, the size and nature of scheme assets and contingent assets, and the needs of the Pension Protection Fund.3 The larger the underfunding, the larger the cost to firms. This levy ran as low as 17 basis points, and ran up to a ceiling of 383 basis points in 2016.4 As such this feature is analogous to being short a credit rating (and scheme asset-liability basis risk) linked coupon. The ‘credit costs’ applied by the Pension Protection Fund, while potentially debilitating and procyclical from the point of view of a sponsor-firm that is sliding rapidly towards insolvency, cap out at rates that are low by public sub-investment grade credit market standards, as well as by bank standards. The risk-based levy is rarely of sufficient magnitude to influence sponsors contribution decisions. Third, there is an optionality component, typically not formalised but whose value could be significant in cheapening the financing cost, taking both regulatory and scheme-specific form. From a regulatory perspective, money ‘borrowed’ through under-contributing can be instantly repaid in full (through special contributions), while cumulative over-contributions can only be ‘withdrawn’ over a very long time period. Furthermore, the covenants attached to pension scheme funding requirements are typically much lighter than those attached to bank borrowings – being able to extend this shadow borrowing in the form of pushing out pension scheme contribution periods must have considerable value from a company perspective. Hence, sponsors of pension schemes can seek to finance current spending/investment by underfunding pension schemes, and in so doing, create long-dated bond-like ‘cov-lite’ obligations. Clearly there is a strong role for the trustees and regulator in ensuring there are limitations on the extent that this is undertaken. Such funding is currently done with low yields that have a small (although highly variable) rating-linked coupon, and includes an American call option. In most cases, this form of financing can appear favourable against other financing options. Having said all that, in our experience, company finance directors tend to view pension schemes as users of funds rather than sources of funds. But the decision as to whether to correct an historic deficit with special contributions, especially if financed through debt issuance, takes so closely the form of a financing decision as to become indistinguishable from one. Given the size and prevalence of these financing decisions, it is curious that they have been hitherto absent from financing surveys (Saleheen et al. 2017). Further research on this topic could focus on modelling the evolving implicit cost of finance associated with underfunding pension schemes against competing sources of finance available to private sector DB scheme sponsors. This could be coupled with understanding whether there is a complete corporate debt market in the UK that would allow finance directors to fully assess and access all funding options during the period of quantitative easing. Joyce, M, M Tong and R Woods (2011), “The Bank of England's quantitative easing policy: design, operation and impact”, Bank of England Quarterly Bulletin Q3. National Association of Pension Funds (2012), “Exceptional times, exceptional measures. Economic developments and the impact on pension schemes and members”, March. Pension Protection Fund (2016), The Purple Book. Pension and Lifetime Saving Association (2016), “PLSA comments on Bank of England's MPC announcement”, August. Saleheen, J, I Levina, M Melolinna and S Tatomir (2017), “The financial system and productive investment: new survey evidence”, Bank of England Quarterly Bulletin Q1. 1 The average private sector DB scheme deficit reported in the 2016 PPF Purple Book was £47.2m on a s179 basis, and £135m on a full buy-out basis. The average size of a non-investment grade GBP-denominated bond is £293m with the smallest being £100m in size, typically for seven-year terms. For investment-grade issuers the statistics are £387m, £100m, and twenty years. 2 In the US this discount rate is related to the sponsor’s expectations for returns of invested assets, and so higher return assumptions shrink the present value of their liabilities. In the UK, International Accounting Standard 19 and FRS17 prescribes that the discount rate should be based on high quality corporate bonds – usually interpreted as AA-rated corporate bonds (paragraphs 78-82 – see here). 3 Information on how the levy works is available here. 4 More on the insolvency risk is described by the Pension Protection Fund here.